Our electronic vending machines are our most versatile, accepting multiple coin denominations and providing pricing and coinage adjustment directly on-board. A more advanced electronic coin mechanism allows for a wider variety of coin denominations. 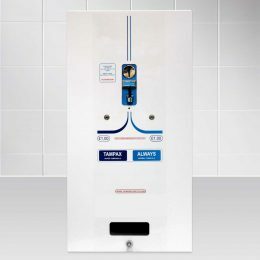 This provides greater flexibility for product pricing and also enables a higher vend price to be set. All configuration of pricing and coinage can be done via the on-board control panel. This offers greater flexibility without the need for the unit to be returned. Power is provided by a long life battery pack, simplifying installation and avoiding additional expense. A unique, battery-extending sleep function enables a battery life of up to 2 years. With sold out and low battery indicators it’s immediately obvious when the machine needs attention. What’s more, an on-board backup battery retains the memory of the coin configuration when changing the pack. As with our machines a robust construction and anti-drill locks with unique lock numbers ensure the takings are stored securely. 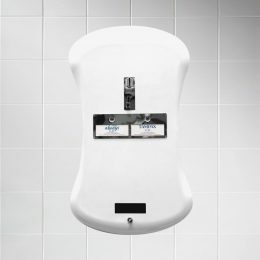 Our new Duo Curve machines feature a modern design that complements other appliances in the washroom. The E-Mini machines feature a classic, sleek and rectangular design.